Well, it's still not complete. But I wanted to share the progress here. 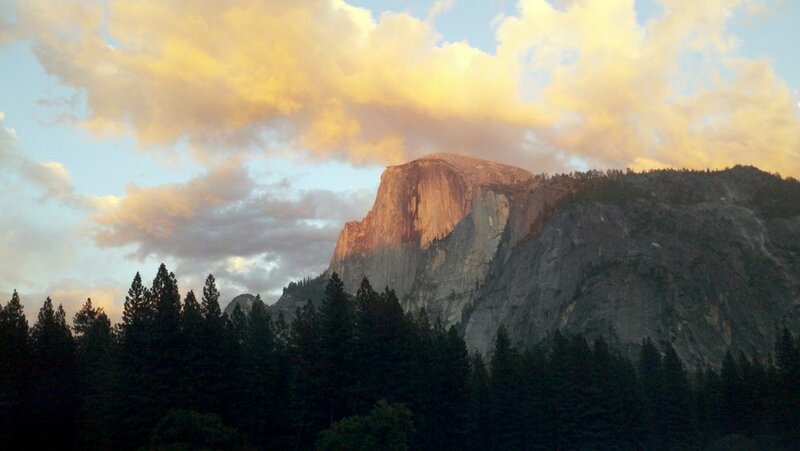 This was last week at Yosemite. You'll see my traveling Art Camper! I spent several days in this lovely spot right across the Merced river from El Capitan. One day a fox trotted right by the van! It was such a lovely and tranquil place to set up my art studio for a day! A close up look, but it's still a long way from completion! Design: My first idea was to create a large mandala, using four 15” cradle boards that would hang together, maybe ½” apart. “The economy of paper” rang in my ears, so I decided to paint the mandala on paper first then adhere to the boards (if good enough). Working it out: I had planned to do a photo transfer of a Madonna I painted earlier this year, placing her head towards the center of the circle, directly on the prepared wood surface. Unfortunately, the transfer process looked yucky on paper. Instead, I carefully traced the head, painted each quarter, then placed them together. (Actually, I played around with the image in Photoshop, and loved the happy accident that inspired her being a Black Madonna.) Unfortunately, the veils didn’t match up, so I painted over all four, matching veil points, which created the four point star in the middle. Liking my photoshopped image, she seemed to want to stay a Black Madonna… but I loved adding in the blue, green, and aqua glazes to contour her face. Almost left her eyes red, but I am happy with the “piercing” quality that turned out. I also liked the way not painting her hair allowed the red to form another pattern, that of an arch. I repeated that arch along the outer circle both in the upside down looking tulip and the church-like arch the stamped image sits under. I drew three concentric circles using a string, to balance and place the objects. I let myself be ok for overlaps. I had planned to paint the main circle a bright red and cover it with the new “Renessance Gold” by WindsorNewton. And, that turned out yucky too. I didn’t want to go to the expense of gold leaf, plus it’s not a mixed media piece, so instead, I layered at least three glazes of Cad Red, mixed with Glaze Medium. 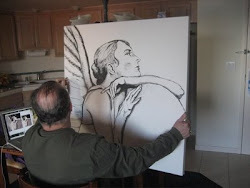 I love the thickness of the underpainting. The Ren Gold never met any of my expectations, so I switched to Yellow Oxide, nice and deeply saturated. Still, the halo didn’t pop the way I wanted so the Hansa Yellow helped as an accent. Painting her face and both placing and painting her hands was the most tedious part. For some reason, all the little images, dots and dashes, circles and triangles, turned into a mindless meditation. 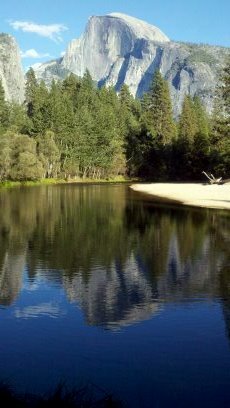 I was sitting in a day-use picnic area along the Merced River at Yosemite. Squirels bombed me with acorns all day, and a beautiful fox trotted by! I’d just pick up one section and lay in what ever color or design appealed to me. Wasn’t happy with the green shapes along the outside, plus the little stamped image was lost, even though painted in turquoise. So adding the hansa yellow highlights, circles and outlines, plus painting more Cad red shapes, seemed to make those images pop more too. I played with the colors by standing way back and imaging what would balance the piece. Hours and hours later… I still feel it’s not as done as I’d like. What I would like, is tiny painted designs that have symbolism and meaning that all hang together to create a meditative mandala. What I’ve learned is that my hand shakes too much, and I’m lousy at painting a straight line, let alone a defined perfect design! If I stand back and blur my eyes, I like it…. But when I look up close and remember what I wanted to do, I see a shaky hand that has trouble with definition. I created the outer circle using the Buddhist praying person stamp, representing adoration, surrender, love, peace, etc. It was happenstance that I thought to put an arch over each one… Then blending a lighter purple at the tip of the arch seemed to give it a spiritual, temple-type feeling. Lots of little “V”s all point towards the center, reminding us where we need to focus. Although there are a line of “V”s also radiating out from the Madonna’s circle, reflecting her love for us. Opps… this is probable WAY TOO MUCH info! I can get carried away with symbolism. I like my paintings to mean something I guess. Thanks for sticking in with the loonnngg read! You’re the BEST! PS… (sorry) I worked on this in class, at home, at the beach in Pescadero, and two full (6 hours or so) days at Yosemite. This was the most AMAZING sunset, with lights reflecting off Half Dome! And this is the picture I'm trying to paint! Wish me luck! I'll post when I get it ready enough to show off. I tend to go over the top and try to do too much... we'll see! Ok... so I've started a new piece of work, actually for my class project. Is supposed to involve repeat patterns, etc. 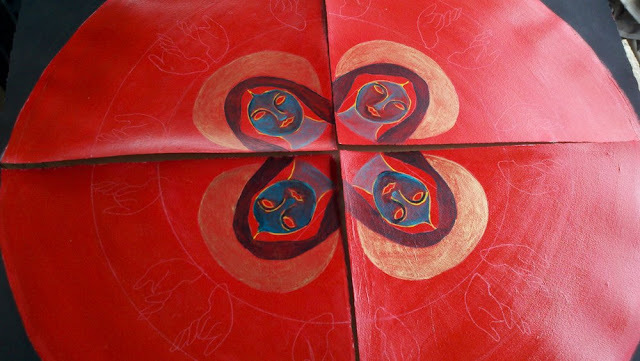 I decided to do a four part mandala, first on paper, then I'll adhere it to a cradle board. It's a larger project, so each quarter will be 15x15", making it just over 30" when it's hung together. My professor says he likes the "economy of paper" and I'm learning so too! I was a bit afraid that the idea wouldn't pan out, but it looks good so far. 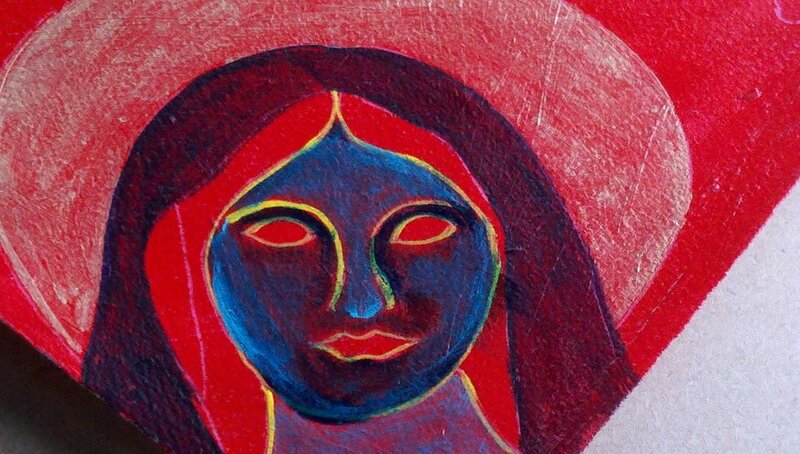 Idea: to use the head of the Mother Mary I painted last spring in the center corner of each quarter, and to use her hands in one of the concentric circles farther out on the wheel. I plan to repeat the patterns I've found between the quarters, elsewhere on the Mandala. 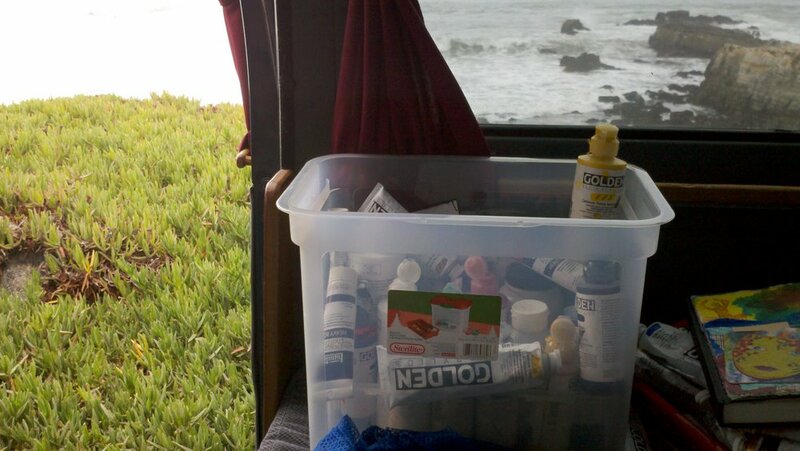 So today I took the van to the beach for uninterrupted painting time... It was so beautiful! and I had a good six hours to work. I had already painted the black background and the huge red center with many layers of glazes. I want to build up many layers, so it looks rich, full, complicated, sacred, and old. I fooled around with the image in Photoshop and loved the black image with colorful lines all over the place. So I traced her face and hands and started painting. She kinda turned into a Black Madona... I like when the painting tells YOU what to do. Here you can partially see my exclusive view! 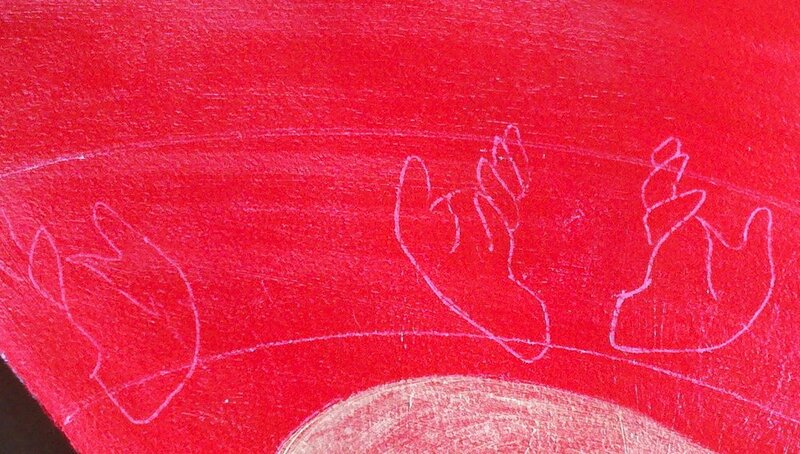 This partially shows the sketch of her hand repeat... I'm thinking of ideas for filling in the spaces. This is a Mandala remember, so I have LOTS of opportunity for embellishments! In the mean time, thanks for stopping by!